A few years ago we created an iPhone/iPad App to learn Vocabulary on an iPhone and iPad. The vocabulary included at the time was for Biblical Greek, Biblical Hebrew and some Latin. An update last year allowed users to pick words from those lists and create their own custom lists to practice. Because of some special requests an new feature has been added in which you can create complete new lists on the http://vocab.idoms.org website which subsequently can be loaded into the App. This allows users to completely come up with their own list to practice in any languages. Currently the only options given are English, Greek, Hebrew and Latin, but other languages can be added upon request. This new functionality can be found under ‘Vocab sets’ and by selecting ‘Download lists from the internet’. This is a In-App feature to support the maintenance of the App itself. For more information about the iDoms Vocab App, please visit the App Store. I wrote this program because of my own need to train my vocabulary. What I find most important is a combination of repetition and automatic progress. This App tries to achieve that. With the use of a point system. The App registers how well you know a word. If you know a word good enough, it will only ask it once in a while for the sake of repetition. When a word is classified as known, a new word is added to the next exercise. A lot of the parameters of the App are adjustable, and this makes it a very flexible flashcard application. The first 50 words are for free to test the App, after that vocabulary sets can be purchased using In-App purchases. The revenue I use to pay towards my development cost such as Developer License etc. The latest addition to the App is the possibility to create your own training sets on the iDoms Vocab website. This allows the App to be used for any two way vocabulary training. It is possible to share those lists with others, or to make them private so you can only use them yourself. This is not limited to specific languages, although only English, Greek, Latin and Hebrew are given as options. Other languages can easily be added upon request. The App is available for iPhone,iPod and iPad, and can be found on the App Store. If you have any problems, then please contact us using the contact form. Please be aware that you need to use the restore purchase function if you want to use the App on multiple devices. This is for free (you will never be charged twice for the same list) and the button can be found at the bottom of the list with vocabulary sets. (note: a small amount of users experience problems with the upgrade to version 3.0 if they are using iCloud. If for some reason the upgrade process fails then a database reset might be needed and the quickest way to get back into business. This can be done under settings. You would need to restore your purchases, reinstall the vocabulary sets and start again. However, the ‘I Know’ button can help to quickly accept words you already know, and to move to a portion of the list in which you previously were). After we have had the iDoms Portal for iPhones and iPads for over 2 years, we finally finished up the first release of the Android version. 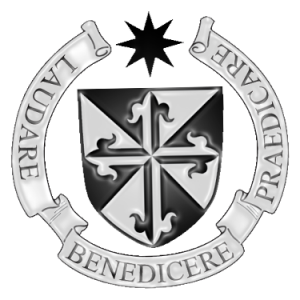 The portal currently provides access to articles, audio files and videos aggregated from the various websites of the Dominican Order. We have been working very hard behind the scenes in creating this new App which is available for free from the Google Play Store. The free App for iPhone and iPad is still available from the App Store. We have also created an App which can be used as a Vocabulary/Flashcard training tool for Greek, Latin and Hebrew, the iDoms Vocab. 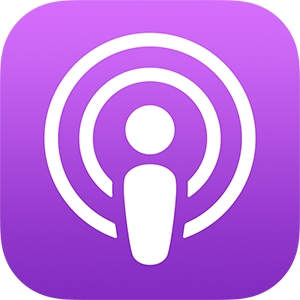 You can read more about it here: the iTunes store.If you have any ideas/suggestions/comments or questions regarding our Apps, please go to the Contact section on the website to email us! There are some significant costs involved in the development and running of this project, so please consider supporting it by making a donation. The iDoms Portal currently provides access to articles, audio files and videos aggregated from the various websites of the Dominican Order. We have been working very hard behind the scenes in creating this App which is available from the App Store and from Google Play. The articles are automatically synchronized and the user can see if there are any new articles or videos available by the unread badge or notifications (which is automatically updated using Push Notifications). Future updates of the application will provide access to a wider variety of content and will introduce extra functionality. Additional applications will follow to help spread the message of the Gospel using this new emerging medium. We have started from scratch with the new App, building it from the ground up. A lot of time has been spent on creating a whole new system which has the capability to be very easily extended. One of the great advantages is that it also allows other organizations to use it to create and maintain their own App in a relatively easy way (please contact us at info@idoms.org if you are interested in discussing the possibilities). 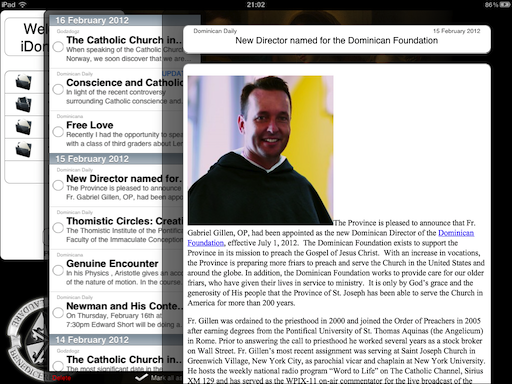 Last year we created the iDoms Reader and became aware that there is indeed an interest in iPhone/iPad Apps which provide good quality Catholic content. This new release is a huge step forward and includes a great new iPad interface which didn’t make it into the first release. We hope you enjoy this update, and please don’t forget to go to the App Store now and dowload the iDoms Portal! 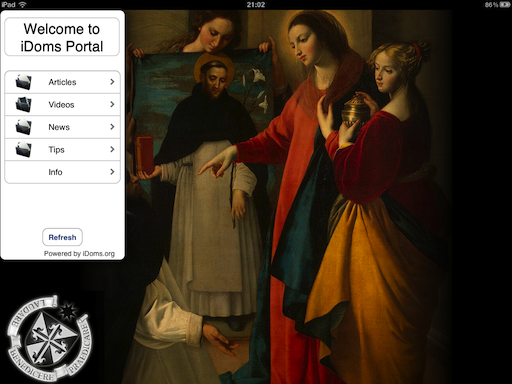 The new iDoms Portal is a way of continuing to respond to the Pope’s call for evangelization in the digital age. The iDoms portal provides access to articles, videos and audio files aggregated from the various websites of the Dominican Order. Future updates of the application will provide access to a wider variety of content and will introduce extra functionality. 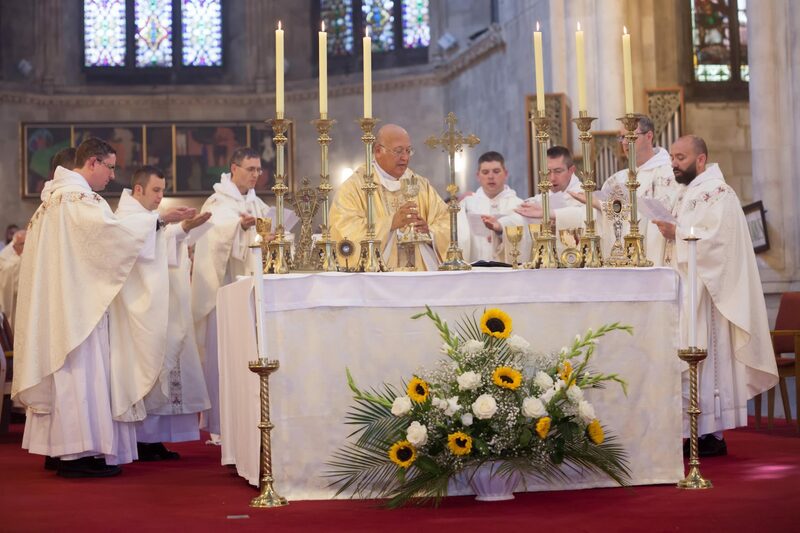 The new app was created jointly by Friars from St. Joseph Province and the Province of Ireland and is suitable for both the iPhone/iTouch and the iPad. So, if you have an iPhone, iPad or Android device, please read more on the iDoms Portal App page or download the iDoms Portal app from iTunes or Google Play. We have also created an App which can be used as a Vocabulary/Flashcard training tool for Greek, Latin and Hebrew, the iDoms Vocab. You can read more about it here: the iTunes store.